In one of the current projects I have to connect to OTRS ticketing back-end. OTRS is an open-source ticketing application and has a web service interface. I thought that querying the OTRS from NET should be straightforward because there were some examples for PHP that looked easy enough, but I was wrong. The second stumble is that the SOAP interface for OTRS methods uses wrapped types, so you have to make the proxy class using SVCUTIL.EXE tool with /wrapped option against the WSDL. The third problem was that choice types in WSDL is not supported by the WCF default serializer, and you have to "downgrade" it to the old XML serializer calling SVCUTIL.EXE with additional /serializer:XmlSerializer option, too. Finally, I managed to make a call with the C# proxy client class against OTRS, but my joy was short-lived. The call to OTRS methods always returned null as a result. I fired up Fiddler to investigate the SOAP call. The call was made well and the OTRS responded in kind with a SOAP response filled with data. But, a slight mismatch was detected: the namespace of the response message element was not the same as the request message. Consequently, the NET proxy didn’t deserialize the message to the right type as the namespaces of the data type in NET and the SOAP response didn’t match. Save, build, run and enjoy the correctly-deserialized response from OTRS. A continuación voy a explicar las frikadas peculiaridades de cada tipo de datos, excepto RegExp y Data que son bastante especializados. Tal como he mencionado anteriormente, los objetos en JS no son tan “fuertes” como en NET. No existe el concepto de clase ni de instancia. En el último ejemplo hay dos paréntesis después de la declaración de la función. Son muy importantes. Sirven para ejecutar la función y devolver el resultado. Si no los ponemos, nuestra variable a sólo contendrá la definición de la función (es decir, será de tipo Function) y no el objeto que la función devuelve. Las matrices (arrays) se definen en JS con un objeto Array o bien con el literal  separando los elementos con comas. Empiezan siempre en la posición 0 y pueden contener elementos de tipos diferentes (no son tipadas). Incluso podemos tener funciones u otros arrays como elementos de un array. El número de elementos de un array se obtiene con la propiedad length. Notad que cuando usamos una expresión, hay que poner punto y coma al final, ya que no deja de ser una asignación de un tipo de datos Function a una variable que se llama miFuncion. La función g() es una declaración, sube por encima de var g y por tanto se pierde al inicializar g con el valor numérico. La ejecución g() no será válida. Si lo cambiamos a una expresión, entonces la última asignación de g será la de la función y todo funcionará tal como esperamos. Supongo que la mayoría de los lectores del blog ya saben de que va el asunto, pero desde hace tiempo quería hacer un post sobre ello. 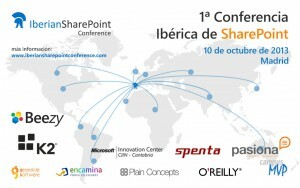 Pues aquí va, por fin explicado desde el principio que es todo esto de la “Iberian SharePoint Conference”. Desde el año pasado, los chicos de SUG.CAT teníamos el “mono” de organizar un evento grande en Barcelona. Mi inspiración personal fue asistir al SharePoint Saturday Belgium en Bruselas. Los belgas organizaron un evento espectacular, más aún teniendo en cuenta que son cuatro gatos contados. Nos dijimos que aquí también podemos organizar eventos importantes y de allí nació la idea. 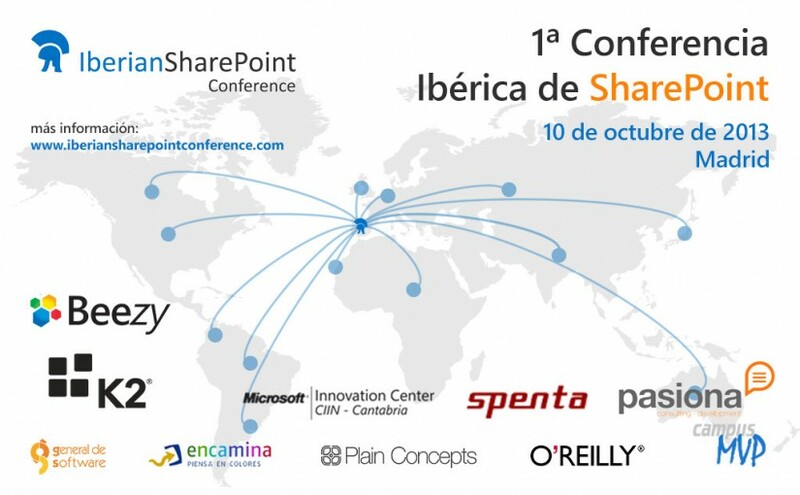 Luego involucramos al resto de los grupos de usuarios de SharePoint de España (MadPoint y LevaPoint), y por supuesto a SUGES, la proverbial madre del cordero. Quedó claro desde el principio que queríamos un evento a nivel peninsular, por lo que contamos con ponentes y grupos de usuarios portugueses. Al final del 2012 ya tuvimos una idea más o menos clara y decidimos el día para el evento. Lo tuvimos que mover varias veces pero al final se quedó en 10 de octubre del 2013. A partir de aquí estuvimos buscando patrocinadores para hacerlo posible (y todavía estamos en ello). Tenemos a los grandes sponsors como K2, Beezy, KwizCom, Encamina o General de Software, con lo que podemos estar más tranquilos desde el punto de vista logístico/financiero. También contamos con un equipo de voluntarios que lo hacen posible. Con tal despliegue de ponentes, creo que los asistentes estarán muy contentos con lo que ven a ver y escuchar en la conferencia. Estamos trabajando para preparar una agenda para todos los gustos, con múltiples tracks de sesiones (desarrollo, administración, negocio etc). Podéis ver las sesiones propuestas aquí. Además, el día 11 de octubre por la mañana haremos dos cursos-talleres: uno para desarrolladores y otro para administradores de SharePoint. Los talleres serán impartidos por los MVPs de SharePoint y se pagarán aparte. La idea es que los asistentes aprovechen la visita y se formen con los mejores, en un curso de alto nivel. ¡Ahora te necesitamos a tí, lector! 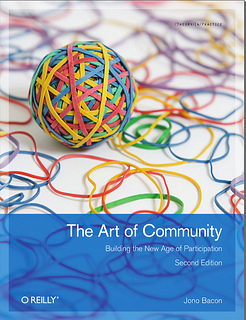 It took me much more time to finish The Art of Community (2nd Edition): Building the New Age of Participation than usual, due to my recent lack of significant commuting as I had no spare time to read much. However, I did finish it and I want to share my two cents about it. I started with no prior knowledge of the author, Jono Bacon. My initial fears about the author were quickly removed by reading the first chapter. Jono has good story-telling skills and the prose is never boring or too verbose. The entire book is packed with real-life anecdotes and references and it’s not hard to read, even if you are not a techie type. This said, in some parts I felt that the book was leaning too much on the “open-source software community” side of things but even that is understandable, given the author experience in those communities. I felt that although he tried to write the book for all kinds of communities, the most compelling examples were the ones he drew from his experience. If there’s one thing to improve in the book, it would be this one. I run a user group, so I was eager to find quick tips and tricks. I did not. The reason was that the book taught me that raising and running a community is neither a one-shot thing nor one-man endeavour. Jono outlines a strategic approach to the community that makes you and your fellow members find the higher purpose for the community, make the long and short-term goals and then enable collaboration and communication to achieve these goals. The book is not a recipe book but a “make your own recipe” book. I really enjoyed the breadth of topics that follow the strategy for a community: how to make decisions, how to contribute, how to design the processes and streamline them, how to manage the conflicts etc. I learned a lot from these chapters. One of the interesting chapters for me was the chapter on running events. Even if I have some experience in the event organization, still I found very important pointers in it. At the end of the book there is a collection of interviews with fellow community managers, providing real-life supplement to the theory present in the book. The people interviewed are very different, from Tim O’Reilly (yes, the O’Reilly guy) to Dries Buytaert of Drupal. All in all, I’d wholeheartedly recommend the book for any current or aspiring community leader/manager/founder/wannabe, even despite the occasional open-source software community bias. The first version of the book is available as a free download, so you are not far away from the reading experience! In this occasion I have been exploring the possibility of an auto-organizing document hierarchy in SharePoint 2010, made with Content Organizer functionality. As you may recall, the Content Organizer allows the documents to be routed according to rules that use metadata to decide where the document should go. 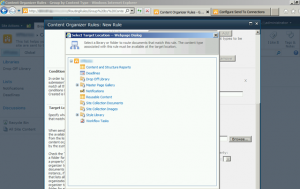 This greatly enhances the usability of a document repository in SharePoint, as the end users don’t have to know where exactly should the document be uploaded. By leveraging the content organizer rules, we automate the exact logistic organization of the documents and significantly lower the possibility of incorrect classification. 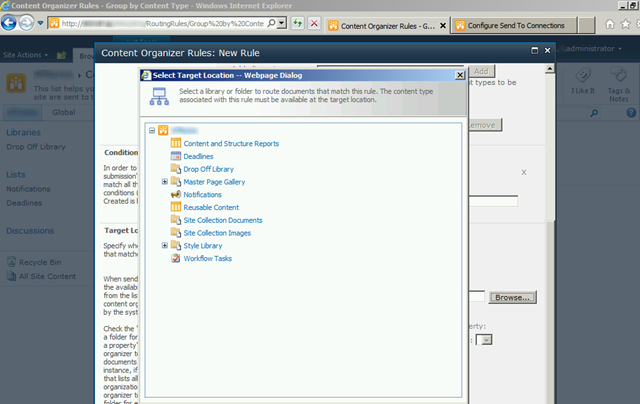 The straightforward Content Organizer works great when you cope with different document libraries on a single site. You get one “Drop Off Library” where you should upload the documents to. 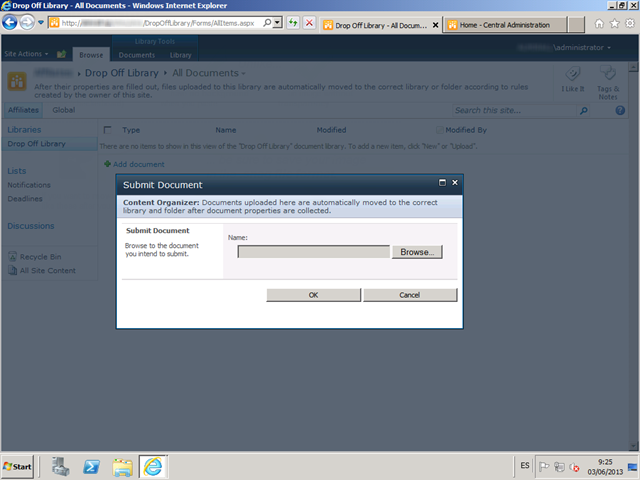 Once uploaded there, the documents will be routed to the right document library and optionally inside a specific folder. What happens when you have a hierarchy that spans multiple subsites that all share the same base content type but are strictly separated in different subsites for security reasons? Well, in this case you have to tweak the Content Organizer a bit to accommodate the subsites. 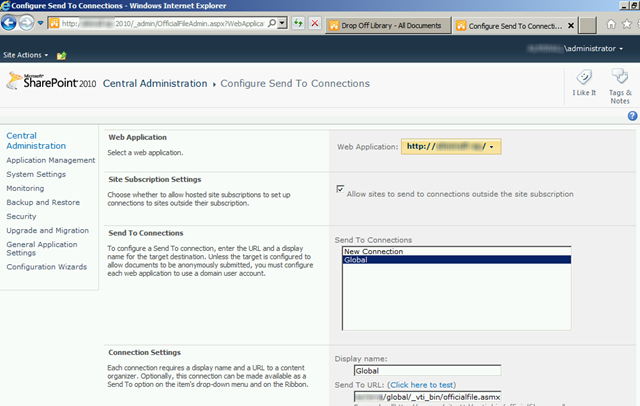 In this example, there is a subsite called “Global” and the “send to” connection" called Global is created. Please remember that the Send To Connections configuration is stored for each web application, so make sure that you are changing it for the right web application. 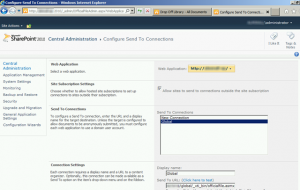 Once you have the Send To connection registered in Central Administration, you have to change two things in the site that you wish to be the entry point to the system. 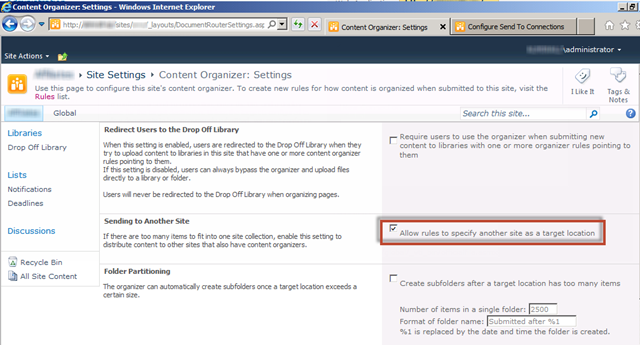 Go to “Site Settings”, “Content Organizer Settings” and make sure that the checkbox “Sending to Another Site” is set. 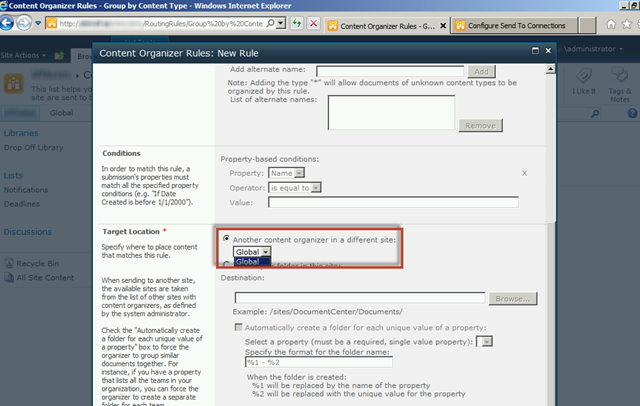 Now you can go to “Site Settings”, “Content Organizer Rules” of the site and create a rule that can target another site. There is one limitation to this approach: you can target a different site but you can’t target a specific document library on that site. 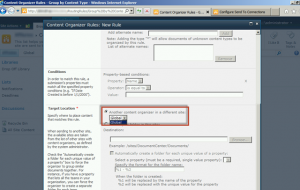 The document will be routed to the Content Organizer on that site and its rules will be enforced. 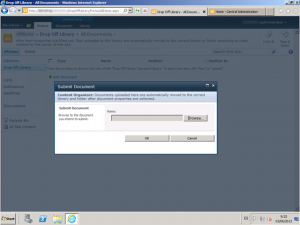 So, in order to overcome this limitation you have to add a rule on the destination site that will route the document into a specific document library. The purpose of this loop is to minimize the number of rules for the correct classification. If the user uploads a Sales document on a HR site, I’d have to write the rule that moves it to the Sales site. 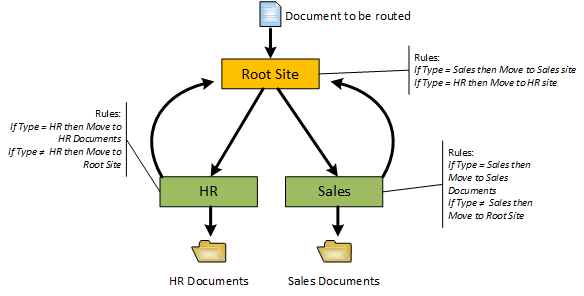 By keeping all the routing logic for the different site at the Root Site level, I just have to send the document to the root site in order to get classified correctly. Note: this setup can cause infinite loop if you mess with the rules and conditions, so please double-check them. 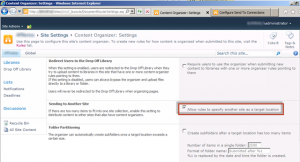 So, we have seen how to organize a multiple-site hierarchy with the Content Organizer feature. I admit that the only boring thing in the whole process is the act of building the “Send To” connections by hand. I have created a tiny PowerShell script that will do that for you. It will parse the given web application URL, iterate over all the sites in the site collections and then will add the sites with active Content Organizer to the “Send To” connections.